Gender Law: Matriarchy: The Founder must be female. Only girls are eligible to be named heir unless there are no female children, at which point boys become eligible for that generation. Heir Law: First Born: The oldest, by order of joining the family, eligible living child is named heir. Surviving to the 10th generation is good, but the challenge is more than just keeping a family line alive. You must both survive and thrive! That is where scoring comes in. There is a maximum of 100 points to be earned. There are 10 categories, each with 10 points available in each. There is also a ‘penalty’ category which can deduct up to a maximum of 10 points. The ten normal categories are all themed after the 10 aspirations. A Sim must be living in the Legacy Family home in order to earn points, but their actual aspiration doesn’t have anything to do with the categories they can earn points for. The Family point category is the most simple of all. You gain 1 point per generation to have an eligible heir reach young adulthood. Your founder is the first generation, so you start the challenge off with 1 point in this category automatically. Since the challenge ends with the birth of the 10th generation heir, the 10th point in Family is obtained by having and/or adopting 10 children in a single generation. Documenting and honoring one’s fallen ancestors is paramount to keeping the family Legacy strong. While family members live and die, they die happy knowing that they will not be forgotten. If you are able to memorialize every member of a generation before their deaths, you earn a point. This includes the heir, their spouse, and any spares that were born or adopted in that generation. The 10th point is earned by having a single Sim complete two out of the three creative aspirations in their lifetime. 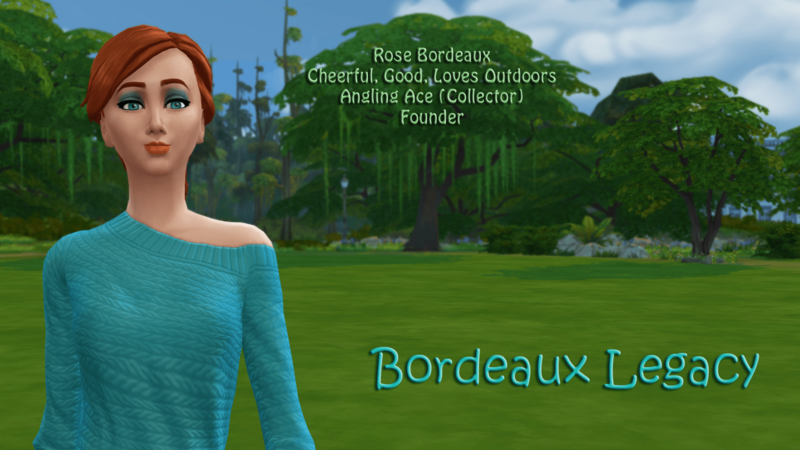 While the founder starts off on an empty grass lot with pocket change to their name, a Legacy Family is expected to grow in wealth as more and more Sims succeed in life and bring in riches for the family to share and pass along to future generations. You earn your fortune points by meeting household worth thresholds. Keep in mind that it MUST be household worth. Cash in the bank does NOT count. Of course, the higher your net worth the higher your bills, so reaching higher and higher in this category will make your bills harsher and harsher., and as you can see, the wealth needed to reach each point gets higher and higher. It is truly a mountain to climb. While the Legacy Family is the star of the show, one cannot deny the unique outsider perspective that the spouses bring in. A family with a deep and diverse array of lovers helps the Legacy Family grow both literally and in wisdom. For every 3 unique traits represented by spouses of your family, you gain 1 point. This equates to a maximum of 9 points if every spouse has 3 traits that no other spouse has had. Keep in mind that this represents a total of 27 unique traits, and there are 35 in total, so you’ll never get all 35. Techniques that let you screen prospective mates for their traits are all allowed, but remember you may only marry randomly generated townies and not player-created Sims., and may only have one spouse per generation. The 10th point may be earned by having a Sim complete both love aspirations in one lifetime. Being skilled is one thing, but being a master at something is completely different. To demonstrate their mastery of many subjects, a Legacy Family must devote themselves to a life of study and practice if they ever want to be known for their skills. You gain points according to the total number of skills that reach level 10. This is among all family members across the legacy who are living on the home lot, so spares and spouses can contribute just as much as heirs can. As you can see, the chart only goes up to 9 points. The 10th point is obtained by having every single skill reach level 10 by somebody in the family. It is the goal of every athlete to push themselves. To hunker down and through the pain and sweat and push themselves the extra mile in order to achieve greatness. This category is about pushing your Sims to greatness through the fulfillment of their aspirations. All nature Sims love their collections, but a Legacy Family gets REALLY into collecting, and more than just rocks and frogs and such. Complete these 10 collections and be the envy of all collectors out there. You earn one point for each collection you complete. No partial points are given for partial collections. Complete all 27 aspirations at least once during your entire Legacy Challenge. A single Sim completing more than one unique aspiration during their lifetime may have each aspiration count toward this goal. Only fully completed aspirations count. Collect and store in your family inventory every single consumable aspiration reward. The food category is a buffet of tasks for your sims to perform. Some easy, some difficult, but all related to food. 1. Purchase the most expensive fridge and stove and upgrade both of them. 5. Have a sim get fat from your family’s cooking. 6. Have at least six Sims (family members or guests) all sitting at the same table and eating at the same time. 9. Have a Sim make their date a max quality meal or mix them a max quality drink during a single date. The only thing more legendary than a well-developed Legacy Family house is a Legacy Family house party! Making your home party central for the region will have everyone wanting to make friends with the family in hopes of securing an invite. You gain points in this category based on the metals you earn from parties and dates. A gold Medal is worth three medals, silver worth two, and bronze worth one. You may also earn one popularity point by having a single Sim getting a gold medal in each of the 4 types of parties AND a gold medal on a date. Many think of evil and mischief when they hear the word ‘deviance’ but in reality they are merely a Sim expressing their impulsive desires in a form that is harmful to others. Not all impulsive desires are harmful, but giving into them is the name of the game here. Now, condensing all their hard work into an elixir that they will never benefit from? Yeah that’s deviant. You gain points based on the total number of potions of youth that are stored in your family inventory. Any family member may have their aspiration points used to purchase a potion of life which can then be added to the family inventory. Keep in mind that your score is based on the CURRENT number of potions of life in storage, and if you remove any, your points may go down. You are still allowed to use aspiration points to purchase other potions and perks, but keep in mind that every aspiration point spent on perks and other benefits are aspirations points that can’t be used to buy potions of life You must decide when it is more important to go for perks or potions of life. A potion of life costs 1,500 aspiration points. Nobody likes to think about the bad things in life. While your Sims are certainly expected to have their ups and downs, there are some downs that are especially low and reflect very poorly on a Legacy Family if they ever happen. This is a point category like all the others, except all points here are negative and subtract from your total score and your goal is to obtain 0 points here. -1 point every time the power is shut off due to unpaid bills. -1 point every time the plumbing is shut off due to unpaid bills. -1 point per child/infant taken away from the family by social services. -1 point per spouse beyond the 10th moved into the house.